A couple of days ago, my wife Kris and I were leaving the Mission at the corner of 5th and Towne, downtown Los Angeles. To paint you a picture - on any given day - leaving the Mission could have its challenges. As the sun sets, the streets really begin to take on a life of their own. The makeshift dwellings comprised of wooden pallets and cardboard seemingly begin to rise from the concrete sidewalks. The more “fortunate” homeless have tents with propane heaters and battery operated lights. Others literally have only the clothes on their backs. These are the ones who wait for the neighboring businesses to close to take refuge in their empty doorways; or who curl up on the cold, hard concrete behind a dumpster or a portable toilet - anything to shield them from the wind or the rain or protect them from the fights, profanity, drug deals and prostitution running rampant throughout the night. On this day, Kris and I left the Mission walking on Towne Avenue toward our car. As we approached our vehicle, we passed by a medium sized cardboard box turned on its side. There were bags of trash nearby, an abandoned shoe, a half-way folded blanket off to the side and what appeared to be clumps of dark clothing spilling out from within. It looked like a tousled box of trash someone carelessly dumped on the sidewalk. It is beyond saddening and disheartening to see one of God’s precious creations living like this. 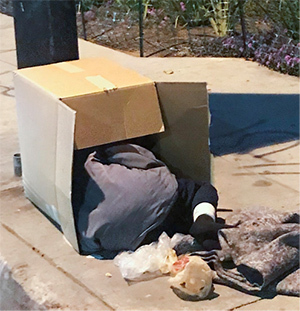 Here was someone’s daughter, possibly someone’s mother, sister, aunt, cousin – and yet here she was...sleeping in a box of trash on the streets of Skid Row. It seems overwhelming at times, dare I say hopeless, but then there’s Jesus…“Yes, Jesus”...who heals the sick, comforts the brokenhearted and gives hope to the hopeless. That is what encourages, challenges and motivates me, Kris, my mom Willie, our entire staff and the thousands of volunteers who serve with us throughout the year. That’s you, that’s me, that’s the brokenhearted on every street around the world – God gave His best for us so that we could be forgiven, saved and restored by His amazing grace. Will you join with me, my wife Kris, my mom Willie and our entire FJM team to continue Declaring and Demonstrating the love of Jesus to those on Skid Row and beyond? It’s your generosity that keeps these mission doors open, keeps hot meals on the table, provides cold or hot beverages to the homeless, provides jackets, blankets, beanies, socks, shoes and so much more to men, women and children in need. For those of you who give to support this work faithfully, “Thank you!” And for those who now recognize the need and have a heart of compassion, then I ask you to give generously today. Thank you in advance for doing all you can to help those in need on Skid Row through Fred Jordan Missions – where HOPE IS SERVED HERE! P.S. The month of February has a particular need for monthly supporters to join our Impact Partner team – Will you stand with Fred Jordan Missions this year by becoming a monthly Impact Partner?